During the North Africa Campaign in 1942, many United States troops were readying an attack on Europe from the South. All these troops were paid in cash. Fearing that the Germans could capture a large amount of this money, the United States Government designed special currency that could easily be identified and therefore declared worthless if seized by the Germans. The $1 Hawaii notes have the series date 1935A and are worth about $20 in average condition. $5 Hawaii notes were issued with the 1934 and 1934A series date and these are worth $40. 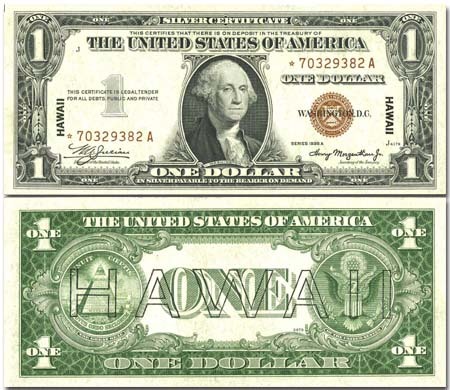 The $10 Hawaii note was issued with the series date 1934A and is worth about $35 . During World War II the government also experimented with new kinds of paper for use as money. The $1 silver certificate was the subject of the experiment. Notes with the special paper were printed with an “S” in the lower right corner and another group of $1 notes were printed on regular paper with a “R” in the same location. Exactly 1,184,000 notes were printed of each type. The results of this experiment are unknown; however these notes are still found in circulation and are worth about $35 each in average condition.